This week Kenneth and I discuss some of the prospects who could be on Seattle’s radar, look at the Seahawks going into the bye and the state of the NFC. Maye is a lot closer to the brilliant Keanu Neal than I think many people realise. He’s 6-0 and 216lbs so he’s right in the range to be a safety/linebacker hybrid (Deone Bucannon was 6-1 and 211lbs at his combine). Maye’s field awareness and read/react skills are superb. He had five forced fumbles last year and already has a sack, a pick and three PD’s in 2016. He has the speed and size to line up vs tight ends and his ability to direct traffic and get to the ball carrier is a good sign for any possible move to hybrid LB/S. There’s evidence of him being able to line up in the box and even set an edge. Great character and the QB of Florida’s secondary. In the video above Maye is #20 and Neal #42. I stayed up until the early hours to watch Washington’s demolition of Stanford and it was worth it to watch the Huskies defense properly for the first time this year. Greg Gaines’ mobility for his size on his sack jumped off the screen, I could watch Vita Vea and Elijah Qualls all day and Joe Mathis might be undersized but he had the game of a lifetime rushing the passer. No wonder John Schneider attended in person. Yet the player who stood out most after Mathis was linebacker Azeem Victor. His range and closing ability stood out constantly — he was always around the ball. He took the right angles, didn’t miss a tackle and just kept a lid on things all night. At the 2015 Husky combine he ran a 4.10 short shuttle — that would’ve been the third fastest time by a linebacker at the 2016 NFL combine (Alex McCallister 4.00, Nick Vigil 4.00). This is a loaded defense without even mentioned Sidney Jones or Budda Baker. He’s been superb in the last two games and he’s one of the main reasons Tennessee somehow remains unbeaten. His sack/fumble led to a touchdown against Georgia (he had two sacks on the day) and he took over the second half vs Florida (registering two more sacks). Great effort player but not a slouch athletically. Is he twitchy enough to go top-25? That’s going to be the question — but there’s a bit of Everson Griffen to his playing style and Griffen didn’t blow up the 2010 combine. Barnett plays with his hair on fire and that’ll make up for some of his possible physical limitations. He has good size for the Seahawks EDGE (6-3, 265bs) but his frame on tape looks more than capable of some inside work too. Florida State’s defense is a mess but Walker is one of the few to come away with his reputation enhanced. His 4.5 sack performance vs Ole Miss was a sight to behold and he was the only FSU defender capable of containing Louisville’s Lamar Jackson. He’s an inside/out D-liner (6-4, 280lbs) with violent hands and the ability to disengage and then explode to the QB. He could play with more consistent intensity but players like this are valuable in the modern NFL. His swim/rip move is excellent and he can win in multiple ways — technique, speed, power. He’ll set the edge playing DE vs the run and collapse the interior as a pass rusher. For more check out this post from a few weeks ago. Impressive range and blitzing ability. Flies to the quarterback when asked to rush and showed potential in coverage vs Tennessee. Plays with intensity and is well respected by the coaches at Florida. Looks a lot like Clay Matthews at USC and not just the hair. Not the SPARQiest player during recruiting — only posting a 108.9 (Darron Lee had a 135.94 pre-draft). Matthews only ran a 4.67 at his combine but had a good split. Anzalone is so similar. You’d like to see Florida use him more as a rusher — against the Vols he was almost exclusively used in coverage and played well. Matthews had a similar issue at USC and then started piling up sacks at the next level. He’s putting it together this year (as noted yesterday — check out the piece) with big performances against CFB’s elite. Impressive vertical, mobility and speed. A genuine modern day X-factor who lines up in multiple positions to create mismatches. Good character and well spoken. Vastly underrated. Averaging 16.25 yards a catch against top opponents including Alabama is not easy. Incredible hands. Love the guy. One of my favourite prospects to watch so far in 2016. Don’t undersell his athleticism and while he’s only around 6-3 and 227lbs — he shows up as a blocker and he can handle work in the slot or split out wide. Just draft him. 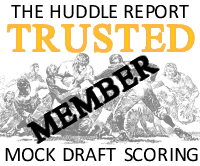 It isn’t a good tackle draft unless others emerge and McGlinchey might be the best available. He definitely looks the part and he’s a chiseled 6-7/310lbs. Former basketball player with the kind of mobility you’d expect — he’s also a well spoken, intelligent individual (something Tom Cable admitted was important after the 2016 draft). Struggled a bit vs Malik McDowell but that’s understandable. Looked at ease vs Duke and Syracuse. Decent balance and ability to set quickly. Kick slide isn’t explosive but good enough and he’s technically sound. Might never be one of the greats but certainly capable of being a starter for a long time in the NFL. He might be the only first round tackle in 2017. The Seahawks look set at this position but Feeney still warrants a mention. He’s adept at pulling and hitting the target at the second level. His pass protection and run blocking is equally good working in a phone booth at the LOS and he plays with the kind of aggression you want to see. Finishes plays. Another impressive, modest individual. Speaks well. Technically sound as well as powerful — shows well driving at the line but also capable of subtle hand use to turn the DL and create a running lane. I’ve not had a chance to watch Lawson or Auburn properly this year but I’m really keen to watch him down the line. His injury history is a problem and could really impact his stock. He missed the entire 2014 season with a torn ACL and missed six games last year with a hip injury (the details of which were suspiciously vague). He has four sacks already this season and if he’s finally healthy he could be set for a major rise. Based on what we’ve seen in the past — in terms of physicality, intensity, ability vs the run and ability to convert speed-to-power Lawson is one of the best 2017 prospects. His size fits Seattle’s EDGE profile (6-2, 258lbs) and he plays big — but does he have the required length? Lawson is a tone setter who plays through the whistle and fits the personality of this defense. Former 5-star recruit. Jimmy Graham is borderline unstoppable at the moment. His blossoming chemistry with Russell Wilson is exciting for Seattle’s offense and he’s starting to look like the 1200 yards, 10-15 touchdown TE we saw in New Orleans. Nick Vannett’s return to health makes the tight end position quite a strength for Seattle. Luke Willson is a very solid #2 while Brandon Williams is a decent blocker and core special teamer. Tanner McEvoy is also on the roster and had his first career pass (and touchdown) yesterday. He’s essentially a WR/TE hybrid and a project who could end up permanently at either position. The Seahawks seem to like McEvoy while their receivers are all signed up for the long haul. Graham isn’t going anywhere and they just drafted Vannett. Yet Willson and Williams are both free agents in 2017 and if both depart — that leaves at least one opening in the off-season. Is there room for another crazy athletic big target on the roster in the future? The line between receiver and tight end is becoming increasingly blurred these days. Big, explosive TE’s with a massive catching radius are all the rage — occasionally taking the place of the ‘orthodox’ #1 receiver. Complimenting these seam-busting giants are the smaller, sudden receivers who work as well in the slot as they do hugging the sideline (eg OBJ, Antonio Brown, Doug Baldwin, Tyler Lockett and lately Will Fuller). The idea of two truly dynamic TE’s has been intriguing since the Gronk/Aaron Hernandez days in New England. It was incredibly difficult to defend. Gronk was the all-round monster and Hernandez more of the ‘joker’ style receiver or H-back. There’s a chance Graham and Willson could develop a similar dual-threat partnership this year — but if that happens it’ll be harder to re-sign Willson. Vannett could be pencilled in for such a role too but appears to be more of a traditional TE that can be used as an extra blocker. Even in that role he’d be an asset in this physical offense. Theoretically you could see all three TE’s on the field at the same time later in the year — with Graham in the slot or out wide and Willson/Vannett book-ending the OL. The point I’m making is multiple TE sets and TE/WR hybrids appear to be here to stay and they might lose a couple of TE’s in free agency. So why not spend a bit of time looking at a player who is extremely underrated today? 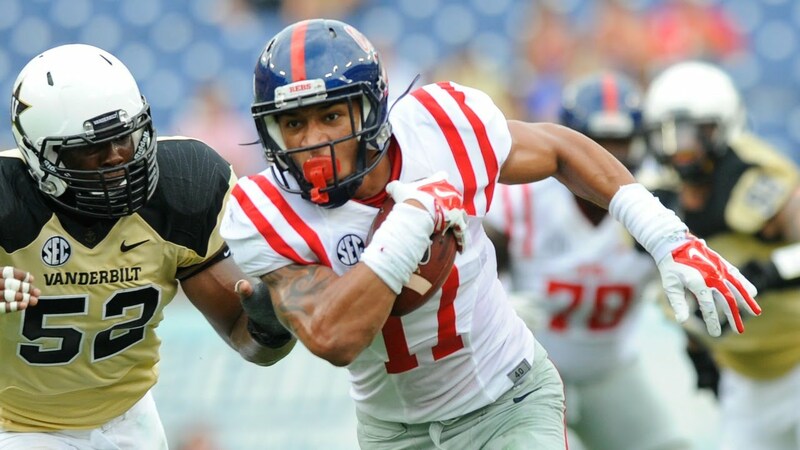 Ole Miss’ Evan Engram is a little bit like Jordan Reed albeit 10lbs lighter. He can line up anywhere — inline TE, detached, slot, H-back. He’s a mismatch. At a listed 6-3 and 227lbs you could just use him as an out-and-out bigger receiver if you wanted. He has the agility, fluidity and athleticism to make it work. So far in 2016 Engram has averaged 95.8 yards per game and 17.3 yards per catch. He is Ole Miss’ leading receiver with a healthy 174-yard lead over #2 target Damore’ea Stringfellow. Engram also has four touchdowns in five games. That’s an impressive return against tough opponents — and Engram is well on his way to a +1000 yard season with +10 touchdowns. Now fast forward to 0:38 in the video below. Doesn’t this catch just remind you of Jimmy Graham’s brilliant one-handed grab against the Jets yesterday? If he runs well — and there’s no reason to doubt that — I suspect Engram will go a lot higher than people are currently projecting. Athleticism + size + character + production in the SEC = high draft grade. It’s worth putting him near the top of your watch list this season. A lot can happen in two weeks. The anguish and desperation and yes — overreaction — that followed the Rams loss has well and truly been put into perspective. The Seahawks — even with a banged up quarterback — are back on track. Russell Wilson has a MCL sprain and a high ankle sprain but still managed a 309 yard, three touchdown performance with zero turnovers. This was a pocket-passing masterclass from Wilson, proving once again his usual mobility is merely an asset and not solely what makes him such an effective thrower. Even better — he didn’t pick up any new injuries. With a week five bye to come he can rest ahead of a home game against the Falcons in a fortnight. — Remember all those (misguided) calls to cut Jimmy Graham after his injury? He had his second consecutive 100-yard game (6-113) including some spectacular and crucial grabs. He and Wilson have really got a connection going and he looks like the player who dominated for so long in New Orleans. With Gronk hurt — who is better than Graham at TE when he’s in this kind of form? — The O-line had a superb game. Todd Bowles’ defense is based around exotic blitzing and pressure. The Seahawks consistently picked up the blitz and really slowed New York’s fearsome front line. You’re not going to pitch a shut-out against Wilkerson-Richardson-Williams but Seattle came close. Bradley Sowell is really coming along at left tackle, Glowinski and Britt looked good on the first viewing and Ifedi settled in at right guard nicely. — The turnovers are starting to come. It’s all well and good testing Richard Sherman. Ryan Fitzpatrick had some success throwing to Brandon Marshall vs Sherman. Yet it felt inevitable that Sherman would get his big play. If you bait the dog eventually it’ll bite. Sherman’s first pick was a huge play in the game and he added a second late on. Earl Thomas also had his first interception. — Another point on the defense — it was four more sacks today and they completely shut down the Jets’ running game giving up just 58 yards. — Christine Michael isn’t Marshawn Lynch and when (if?) Thomas Rawls gets healthy he might go back to being the #2. Even so — he isn’t letting anyone down. He’s making key plays (including in the passing game), taking what’s on offer and not making any significant mental mistakes. He deserves praise. — C.J. Spiller probably won’t have a major role — but the fact he got a touchdown on debut in the red zone is a really positive sign. He could end up being an absolute steal if he can make a handful of good plays this year. Let us know who you’re watching today and of course… let’s talk about Lamar Jackson vs DeShaun Watson (otherwise known as Louisville vs Clemson). Stanford at Washington. Wisconsin at Michigan. Louisville at Clemson. Three top-10 matchups. One weekend.